A group of local sewers met last weekend, as we do every few months. As always, it was nice to have a coze with people who are just as nuts about sewing as you are, and know about all the new patterns and things happening online – and to swap fabric and patterns too. I realized something afterwards, though; I need to sew more and think about it less. I’m the kind of person who likes to know exactly how things are going to go before I start a project. This has its bright side – I’m great at research and problem-solving – but it has a dark side too. Sometimes I am reluctant to just try things and muddle my way through a project. The gals at the meeting this weekend had done some really cool projects, but they weren’t completely beyond my abilities. I’m not a total beginner, anymore; I’ve learned a lot about sewing and I can figure out most things if I make an effort, yet I still think I can only be successful on the simplest possible projects. And I buy patterns and fabric and then put off using them, because I’m afraid it won’t come out right. The more I sew, the more I start thinking about it as a practice, like a meditation practice. Long-term meditators and committed artists often talk about how they come to the work and the work teaches them the things they need to learn. I think the thing that sewing’s trying to teach me right now is that I need to let go of the need for everything to always be planned out, to stop being afraid of things going wrong or not being perfect. 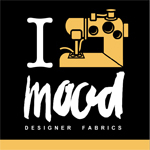 And now, I’m off to try to finish up my mini-quilt for the Modern Quilt Guild meeting tomorrow afternoon…eek.